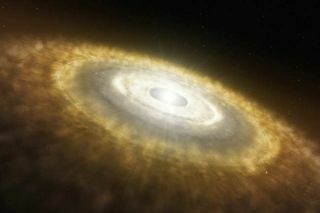 Artist's impression of a baby star still surrounded by a protoplanetary disc in which planets are forming. The search for planets beyond our solar system may be alittle easier, thanks to a new comparison of sun-like stars that has revealed akey difference in the chemistry of stars that have planets and their barrencousins and solved a long-standing mystery about our own sun's chemistry. The solar mystery revolves around the abundance of the elementlithium in the sun. Unlike most elements lighter than iron, lithium is notreadily produced in stars. Instead, it is thought that this element was mainlyproduced just after the Big Bang, 13.7 billion years ago. Most stars willthus have the same amount of lithium, unless this element has been destroyed insidethe star. Models of stellarevolution predict that stars of about the sun's mass and age should have arelatively high level of lithium because their atmospheres aren't hot enough orthick enough to burn off the element. But astronomers see a range of lithiumlevels in sun-like stars, with some having a lithium abundance of about 10percent of that estimated for the primordial universe, and others --such as thesun -- having only 1 percent of the primordial abundance. Because there seemed to be no way for sun-like stars to burnoff this lithium, astronomers were left with a conundrum. That's where theEuropean Southern Observatory's HARPSspectrograph survey of hundreds of stars came to the rescue. But by looking at the sun-like stars in the HARPS survey,about one-fourth of the total sample, astronomer Garik Israelian, of Spain?sInstituto de Astrofisica de Canarias in Tenerife, and his colleagues found thatthose that had an orbiting planetary system had lithium levels similar to thesun's, while those that were barren had higher levels. "The explanation of this 60 year-long puzzle is for usrather simple," Israelian said. "The sun lacks lithium because it hasplanets"
Just why stars with planets lack lithium has yet to beexplained, though astronomers have some theories involving the interactionsbetween stars and their planets. Israelian and his colleagues suggest that early in a star'slife, the presence of planets or a proto-planetary disk might influence thestar's rotation in a way that increases the mixing between the surface and thefiery interior of a star. The increased mixing could move lithium down todepths where it is hot enough to burn the element up. But astronomers will have to work with models to see if thisexplanation holds up. The low lithium signature of planet-hosting stars confirmedby Israelian and his team also suggest an easy and efficient way to look formore undiscoveredplanetary systems, they say. In fact, Israelian and his colleagues think that "amongdozens of planet host candidate stars, those with low lithium abundance willhave [the] highest chance to host planets," Israelian told SPACE.com. The team's findings are detailed in the Nov. 12 issue of the journal Nature.